The city of Boston has histrorically had a reputation for its international ports and its textile manufacturing industry. Manufacturing in general has dropped in the US over the years, however while the textile manufacturing industry still remains very strong in Boston, other industries have become more dominant in the last 20 years, and Boston continues to be a viable economic center that is still experiencing growth. The economy in Boston has seen a shift away from textile manufacturing and more towards technology manufacturing and service industry jobs. The major industries in Boston can be broken down into the urban industries and the suburban industries. 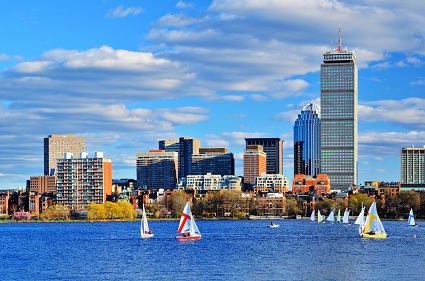 In the city of Boston itself, the primary industries are finance and professional services. The city also contains much of Boston’s technology manufacturing as well. Eugene, Oregon, is in the top five for a number of reasons, but the biggest of these reasons has to do with electricity. The city of Eugene gets almost half of its electricity from renewable resources. Most of western Oregon gets around 34% of its energy from hydroelectric dams, but Eugene takes things a step further by adding on 9% from wind farms. The city’s water utility– EWEB– even buys back excess energy produced by residential solar arrays. The city of Oakland, in the state of California, has been long-heralded as one of the most forward-thinking cities in the US on the environmental front, and that has helped to drive new technologies in Oakland. The most impressive of these technologies are the hydrogen-powered buses that roam the streets. These buses have significantly cut down the pollution in the city, and have helped to develop this technology into a more economical form. Boston has a highly developed public transit system, as well as an impetus toward innovation and new technologies. This is highly evidenced by the unique system that Boston is implementing to help produce methane for generators. They are using bacteria within residential glass clippings to produce the methane. This is a fuel source that is readily available, and which would only be going to waste otherwise. Modest projections state that the system has the potential to create enough methane to power 1.5 megawatts of electricity. At the end of the composting cycle, the grass and leaves will have turned into a source of fertilizer that can be used for residential or farm fertilizer. San Francisco, California, is another of the cities with a highly developed transportation sector. Public transportation is a large part of how people get around here, and it has a significant impact on the air quality and health of the people living here. Also, San Francisco has one of the most aggressive large-scale photovoltaic projects in the country, with massive potential for both environmental and financial benefits. Portland, Oregon, is the most eco-friendly city in the United States. While it lags behind other cities in terms of energy and electricity, it blows past them on things like public transit and green construction. 35 buildings in Portland are certified by the U.S. Green Building council, and a quarter of workers in Portland commute by bike or public transit.